It’s summer time! Bring on the BBQs, the bikinis, and of course, the bug spray. But most of all…bring on the beach reads. One of my favorite summer beach reads was suggested to me by a gaggle of former students. They compiled a list of books I simply had to read. As promised, I’ve been making my way through their list, reading everything from Wicked, The Twilight Saga, to Jennifer Crusie’s Bet Me. The later totally took me by surprise. If you ever find yourself in Oregon, stop by this local fav. You won't be disappointed! The courtship between Min and Cal is centered on food. I appreciated this premise. It’s relatable. When Brian and I reminisce about the early days of our relationship, there is often food involved: McMenamin’s tatter tots, The Chippery’s ketchup chips, Marzinni’s breadsticks, American Dream’s calzones. Some restaurants are so loaded with associations that their mere mention brings back a flood of memories: Tommy’s, The Beanery…El Presidente. For Min and Cal it’s all about Emilio’s Chicken Marsala. This is their go-to meal. So much so they even cook it at home. When Brian and I started dating, I sucked at cooking. I—a vegetarian–once forced my omnivorous boyfriend (now husband) to consume soy “hotdogs” because I knew I couldn’t screw up zapping them in the microwave for 45 seconds. But my roommate and culinary guru Beth taught me a recipe that what would become our “go-to-meal.” Despite its simplicity, it always tasted gourmet. Our go-to-meal was spaghetti pie. Enjoy! Cook pasta according to package directions and drain, but do not rinse. Place back in pot. Add butter, parmesan cheese, salt, pepper, and egg to pasta. Allow butter to melt. Meanwhile, brown onions and green onions in a little bit of olive oil. Add spaghetti sauce, sugar, oregano, and garlic salt. Allow to simmer for 15 minutes. Pour sauce over cottage cheese. Sprinkle with mozzarella cheese and bake for an additional 10 minutes or until melted. 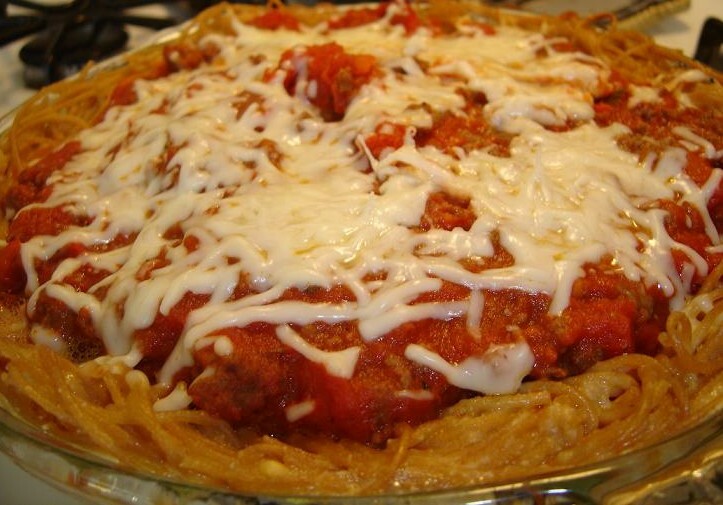 This entry was posted in Bet Me, Books, Italian Food, Uncategorized, Vegetarian and tagged easy italian recipes, how to make spahetti pie, Spaghetti pie recipe. Bookmark the permalink.